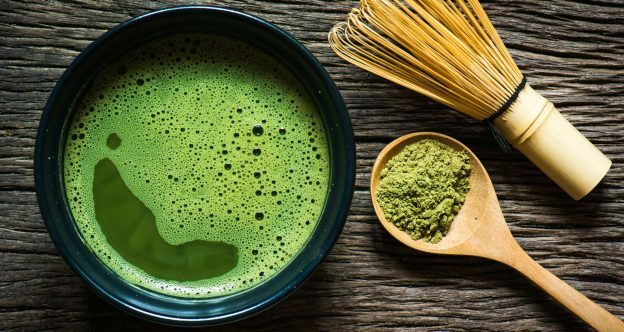 Matcha Tea - What Makes it so Healthy? - U-RAAW! Matcha tea has become one of the latest health trends. Even Starbucks has added a matcha green tea latte to their menu. Matcha is most often consumed as a tea or a latte, but there is actually many other ways to get your daily dose of matcha. You can mix matcha powder into your morning oatmeal or baked goods. You could blend it into your smoothies, or even sprinkle it on popcorn! Eating matcha is easy enough… so why is it that we should be eating matcha in the first place? Matcha tea is native to Japan, but used all over the world today for it’s numerous short-term and long-term health benefits. The amount of antioxidants in matcha tea is crazy. In fact, one cup of matcha tea has as many antioxidants as ten cups of green tea! Antioxidants are so important in the human body. They are the body’s defence agents: protecting against infection, chronic disease, and aging. Matcha contains both caffeine and L-theanine. Caffeine consumption has been linked to improvements in brain function and can enhance memory. L-theanine complements caffeine because it can actually change the effects of caffeine to promote alertness without the energy crash that typically follows caffeine consumption. Matcha has even been proven to attention and reaction time. Matcha contains a type of catechin called epigallocatechin-3-gallate (EGCG). EGCG has incredible anti-cancer properties, and has been proven to inhibit the growth of cancer cells. Catechins helps prevent cells from damage by reducing the formation of free radicals in the body. Matcha aids in weight loss because it has the ability to speed up your metabolism. Matcha and green tea extract increase energy expenditure as well as increase fat burning by 17%. Not only does matcha help reduce your body weight, but it can then aid in maintaining that weight loss. In the end, moderation is just as important as with anything other food when it comes to matcha. Although this seemingly magical green powder is stalk full of health benefits, one or two cups per day is more than enough. What is your favourite way to eat matcha? Let us know in the comments below! This entry was posted in Diet & Nutrition and tagged antioxidants, cancer prevention, green tea, health drink, matcha, matcha latte, matcha tea, weight loss on March 24, 2019 by Megan Van Dyke.